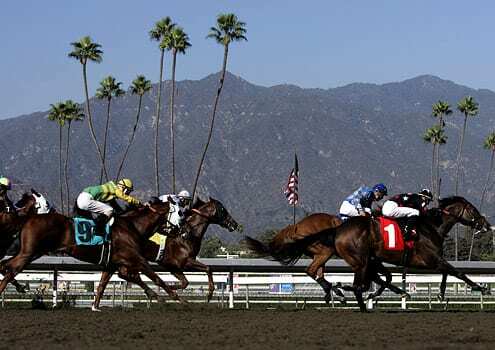 Statistics released Friday by the California Horse Racing Board indicate that the number of equine fatalities on the state's tracks rose five percent in the last fiscal year (July 1, 2011 to June 30, 2012). The increase was most pronounced among training fatalities on both dirt and turf at Santa Anita, which went from 12 in the 2010-11 fiscal year to a whopping 42 in 2011-12. Santa Anita's main track was not open for training for much of late 2010 while it transitioned from a synthetic to a dirt track. In total, the Daily Racing Form's Steve Andersen reported, 278 horses were euthanized in California, either from injuries related to racing or training, or due to a wide variety of illnesses such as colic, respiratory illness, or neurological disease. This entry was posted in The Biz and tagged California Horse Racing Board, california racing, horse racing and breeding, horse racing fatalities, santa anita park, Thoroughbred fatalities by Paulick Report Staff. Bookmark the permalink.